This Publishers Weekly piece seems to me to be stuffed full of tiny inaccuracies. Is it really true that “Currently, publishers are required to print a pricing bar code, or five-digit add-on, next to the ISBN bar code on book covers and jackets.” The article does go on to clarify that this is really done so that Barnes & Noble and other large retailers can easily check-in stock, but “required”? I don’t think so. B&N stocks plenty of books without prices printed on their cover or jacket — they will sticker them, as many retailers do anyway. The cost of stickering is, however, often billed-back to the publisher. Steve Bercu of ABA implies that flexibility of pricing would enable booksellers to price to local conditions. But it’s not as if they can’t do this today. I grant that it would be a brave bookseller who charged $2 more for a book than his competition — but the reason they don’t do this has nothing to do with law/requirements/necessity — the decision would be exactly the same whether the book had a price on it or not; just less obvious. Today most university press books don’t have prices printed on them, and surprise, surprise booksellers are able to figure out the price they should be asking. Given that one of our concerns nowadays is people searching on their smart phones for the lowest available price, marking you books up doesn’t seem like a really good strategy. Cynthia Ozick’s sentimental excursus in this Sunday’s New York Times Book Review is hard to figure. Is she merely being ironic? Or does she actually mean some of it? She differentiates two separate groups of writers: young writers who are all about ambition, networking, money and glitz; and old writers who focus instead on crafting a good story. Maybe what she really wanted to say is that she doesn’t like creative writing programs and networking, which is of course just fine. I guess that there are not too many older people who spend as much time networking, as we now refer to keeping up with friends, as young people do. When you are young and haven’t forged a “way” into which you can get set, you spend a lot of time keeping up with this person and that person — because who knows, they may turn out to be the sort of person you want to keep by you. Older people know who they like, and are happier to restrict their socializing to that select group — which may of course in extreme cases be as small as one. I think we all pretty much know this, and I don’t believe it has any implications for writing, so why are we devoting a whole page of the Book Review‘s all too small allotment of pages to saying it? And the suggestion that today’s older writers, when they were young, were somehow above all this sort of behavior may be true of Ms Ozick, but surely just wasn’t the case. Samuel Johnson famously said “Nobody but a blockhead ever wrote except for money” (Boswell’s Life of Johnson, April 5th 1776). Boswell adds “Numerous instances to refute this will occur to all those who are versed in the history of literature”, though he doesn’t say whether he made this rejoinder to Johnson’s face. We may not agree with the sage either, but who among us ever thought that it was only young writers who cared about money? This horse doesn’t need beating with example after example. Of course, just as with friends, one can draw an equation between money-needs and youth. As people get on they tend to accumulate more, and need less as children grow up and leave home, so the search for royalty income may become less fevered. But writing for money can’t really be a habit more widespread in any one age group than in any other. In what world is it true to claim “Old writers are taken to be as nonessential as old magazines that long ago expired: they are repetitious and out of date, they fail to be of interest even to themselves, they are worn out”? (I would conclude that all this must be irony, were it not for the fact that if you remove the irony, there’s not really very much left in the essay.) Just a couple of pages before Ms Ozick’s piece we find the week’s fiction bestseller list headed by The Girl of the Train by Paula Hawkins. It’s not altogether clear what age she is, but if she’s been a journalist for 15 years before turning her hand to fiction, she has to be in her mid thirties. Maybe this counts as young. Running down the list from there we find Anthony Doerr is 41; C. J. Box, 47 or 48; Anne Tyler, 73; Kazuo Ishiguro, 60; Debbie Macomber, 64; Kristin Hannah, 54 or 55 ; Dennis Lehane, 49; Clive Cussler, 83; Danielle Steele, 68; Ian Caldwell, 39; Jeffery Archer, 74, and so on. Now it’s true Mr Cussler does have a co-author, so maybe Ms Ozick, now 86, could argue that he’s obviously “nonessential”, but looking at these ages one is not hit in the eye with the conclusion that age is any barrier to writing for financial success. Well I’m here to tell you it’s not, and I’m not kidding either. Not of course that there’s anything wrong with listening to books: it’s how it all got started after all. When there was nobody around who could read at all Homer and his fellow storytellers would recite their tales to us. To say listening to an audio book is reading is like saying a zebra is a horse. They are connected of course, but a is not b. People who can’t read (the illiterate) can listen to an audiobook. Reading an e-book is reading. Reading a print book is reading. Reading a Braille book is reading. Reading The New York Times on-line is reading. Listening to the news on the radio is not reading though of course it may be delivering the same information. Well maybe Frank isn’t as bright as his more famous cousin. I hope his books do well though. They may equal serious fun, without having to equal serious fun reading. James Harbeck has an interesting piece in The Week, which gives examples of the way things were pronounced in Britain, going back from Shakespeare’s England to the time of King Arthur. (Thanks to The Passive Voice for the hint.) Ben Crystal doing a Shakespeare sonnet sounds now Irish, now Somerset, now Northumbrian. But we’ve no reason to doubt that his interpretation is basically accurate. The main point is that Shakespeare didn’t speak with an Oxford accent. The Beowulf bit, which is in the video below, is particularly impressive, and tends to confirm the idea that in a pre-literate culture tonal and pitch emphasis will play a greater role in the way a language is used. It may be surprising to learn that Benjamin Bagby was born in Illinois — he sounds so Viking. I wonder if there’s any tendency for pre-literate languages to use pitch and inflection more than literate ones. Of course all languages, except Esperanto I guess, are survivals of pre-literate languages. One can see how writing things down might lead to greater rigor and complexity in a language. Latin almost seems like computer code: the rules are so extensive and so consistent that one could imagine its being born not from people talking to one another, but from authorities writing things down in “the right way”. Of course this can’t really be true: there were Latins before there was writing. But maybe its spread across a vast Empire was facilitated by written text and led to some sort of leveling off as the language base grew wider and wider. I guess I’ve been guilty of thinking that there was nothing we could do to save them, but that is of course way premature, and also far too supine. If we think there’s any reason to, there are obviously things we could do to help: like going there and spending money. Whether we can succeed to save the bookstore we cannot know, but if we give up the struggle to save bookshops, we will certainly lose them. I assume that bookshops are “a good thing”. Most people in publishing do too. But it’s getting to be a long walk in Manhattan now to find a bookshop. When he took over as editor of The Bookseller a couple of years ago, Philip Jones reports that “some publishers said he would have to change the title of the magazine to The Publisher, ‘because there wouldn’t be any bookshops left’.” Well, maybe there will be just one. Unless someone comes up with some plan to do something we may be headed down that road: and nobody seems to be suggesting anything too dramatic. Independent Bookstore Day is a good idea, but it is rather preaching (a very brief sermon) to the choir. Publishers are wrapped up in their own problems, and in any case there’s no real way to calculate just how damaging losing our bookstores would be. It’s one of these things you can’t know until it’s too late to do anything about it. In Britain we used to have the Net Book Agreement — a resale price maintenance deal which was scrapped for a variety of reasons. The explicit justification for it was to keep bookshops viable, and it did seem to do that. Nowadays the idea of making customers pay even slightly more for anything is a complete political no-no on both sides of the Atlantic. “It is important that bookstores survive” says Sam Husain, soon to retire as chairman of Foyles in this BBC interview linked to via Shelf Awareness. But then he would, wouldn’t he? Foyles has recently opened a new flagship store in Charing Cross Road and must have a big nut to cover. 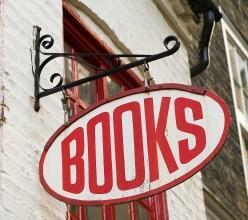 Here’s a discussion of the future of bookstores from Publishing Perspectives. I doubt if we would be wise to sit back and rely on government action for the salvation of the bookshop, but of course these escalating high street rents are a problem everywhere. It seems as if only international clothing chains can afford to move in when any vacancy occurs. The homogenization of retail across the world makes it a bit silly for those shopping tourists to pay for the airfare — aren’t they getting almost the same experience at home? If we could decide bookstores were an unambiguous good, and fear of their loss not just a sentimental reaction to an uncertain future, could cities not subsidize rents for bookstores and indeed cultural institutions of all kinds? I fear that such paternalistic use of tax funds is vanishingly unlikely nowadays though. The real question to the skeptics and supporters of market efficiency is whether that value is enough for them to do anything about it? The ten most difficult books? Well this is another of these reductive circular discussions we all love. Publishers Weekly has a report on The Millions survey of the ten most difficult books. We can all think of more difficult books than the first one on their list, Nightwood, I’m sure. The style may be as off-putting as they say, but nobody could argue that it was as difficult as say Newton’s Principia Mathematica, in English or Latin. But maybe the tacit rules prohibit our choosing scientific texts, or philosophical treatises, and any other books which we would conventionally regard as difficult — though they do allow Hegel and Heidegger in there. Clarissa is long, but surely in no way difficult. Does length qualify as difficult? It may present an additional layer of difficulty if the text is already hard, but it’s surely not in itself a difficulty. What is it that makes a book difficult? Let’s just restrict this to “literary” works, not advanced texts on nuclear physics and so on. Lydia Davis gives us periodic updates on her reading of “the Telemark novel” by Dag Solstad, in Norwegian, a language she doesn’t know, without the help of a dictionary. The book is apparently very long — long enough that Ms Davis’ Norwegian is getting better and better as she works her way though. Now that’s difficult. For myself “difficult” works at two levels. First the surface level of vocabulary and syntax. The obvious candidate here is Finnegans Wake; I don’t think I’ve never gotten beyond page 10. Maybe this is odd, because I do like Ulysses, but the language there is pretty straightforward. You do have to work at Finnegans Wake; they say that reading it aloud in an Irish accent helps (though what that does for your neighbors in the subway is undisclosed). Shamefacedly I have to confess that part of the problem is the sheer bulk of it: 628 pages in my Viking edition. Maybe it would be better to attack it as an e-book. As I’ve argued before, the fact that you have no real conception of the size of an e-book while you read it, may make the task easier than lugging around that obvious tombstone of a physical object. Still I do assume I will engage with it sooner of later. Less likely I fear is much engagement with Gertrude Stein. She seems difficult in a much more unearned way. Here I refer specifically to Tender Buttons, a kind of prose poems. Take the first one, “A carafe, that is a blind glass”. It reads in its entirety “A kind in glass and a cousin, a spectacle and nothing strange a single hurt color and an arrangement in a system to pointing. All this and not ordinary, not unordered in not resembling. The difference is spreading.” I know there are those who value this: they love it at ModPo* — but to me after all the close reading work, and there obviously is close reading that can be done, you end up in a place where you just shrug and say “So?”. It’s the literary equivalent of cubism: all surface trickiness and no content. The other form of difficulty is more baked in. It’s not not understanding the words, it’s the keeping it all together in the front of your brain, the focussing on where we are going, that presents the possibility of disconnect. So you’ll be happily reading along when you realize you’ve no idea what’s happening on the page. Who is this character? What are they doing here? And where are we anyway? I accept that sometimes this is the reader’s fault: we can unlink our brains from our eyes and read without “reading”, but sometimes the disconnect is caused by the author. Usually I suspect it’s intentional, wanting the reader to work harder, to make the rewards of the reading greater, to vaunt the seriousness of the writing. I’m finding a hint of this in William H. Gass’ writing. Many (not I) would say Faulkner at this point. Ontological difficulty would seem to be at the root of my troubles with much modern poetry. I honestly do think playing with words is fine; I just think it’s usually more amusing for the ludic poet than for the ludibrious reader. * ModPo, Modern and Contemporary American Poetry, is the most successful of MOOC I know. It is conducted by Al Filreis of U Penn, sitting at a table in the Kelly Writers House with a number of graduate students, discussing this poem and that poem in an introduction to contemporary poetry tracing its origins back to the two contrasting strands of Whitman and Dickinson. Maybe you all know all about this, but I just found out. There’s an intriguing annual series at The Millions, entitled “A year in reading”. They get various people to write about the best books they’ve read during the year. Anthony Doerr’s verdict on his 2014 selection, “it’d probably be dismal to read all at once. But for the month it waited on my nightstand, I found myself looking very forward to reading a few pages each evening” might be how one should regard the whole series. You’d go insane poring over it; but dip in and out and it’s quite fun. Here’s a link to 2014’s list. At the right you can see links to other years back to 2005. Oops. My dipping suggests that I have read very few of the best books of the years sampled. Mindell Dubansky of the Metropolitan Museum of Art is assiduous in bringing us examples of what she (and for all I know others) refers to as “blooks” — things that look like books but are not. * I have linked to her site About Blooks several times. 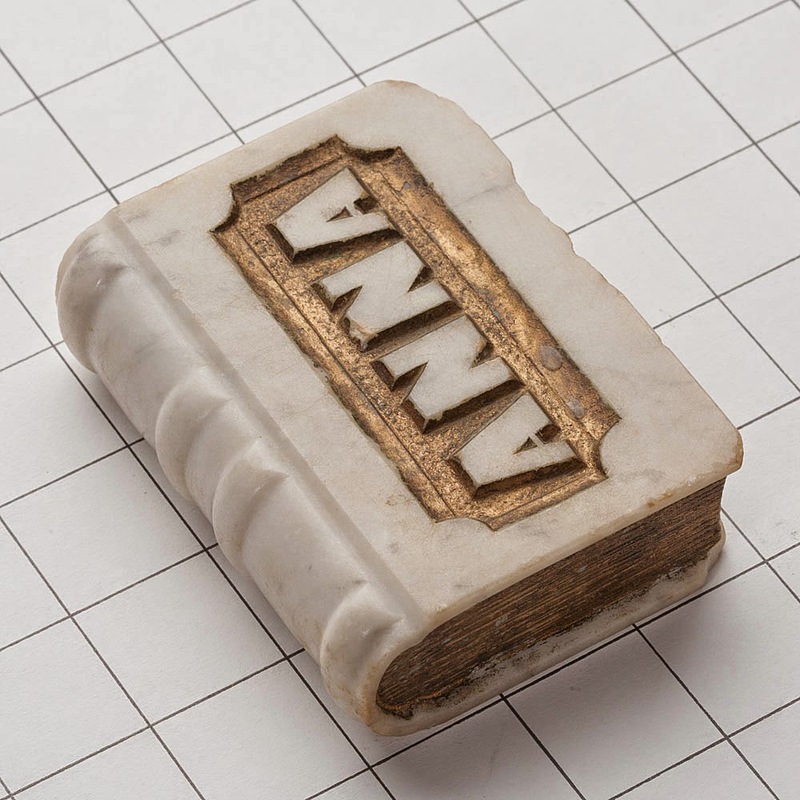 She has a small post with big pictures by Ian Berke who collects books carved from stone. Mr Berke has a more thorough-going piece at the Maine Antique Digest site. Some of these books are quite striking. Mr Berke surmises, not unreasonably, that these books would have been carved by skilled stonemasons in their spare time as a memorial to someone special. As a child I used to spend hours hanging around a stonemason’s yard in Galashiels. The whole process was fascinating, from cutting blocks of stone by a back-and-forth hanging plank which used carborundum to wear away the stone, to polishing, and carving inscriptions. Even by then hand work was getting expensive, so most of the commissions were relatively straight-forward. However lapidary the prose though, I never came across a carved book. The Classical Bookworm shows a couple of examples, one of an open book looking like it has been dropped on the ground. 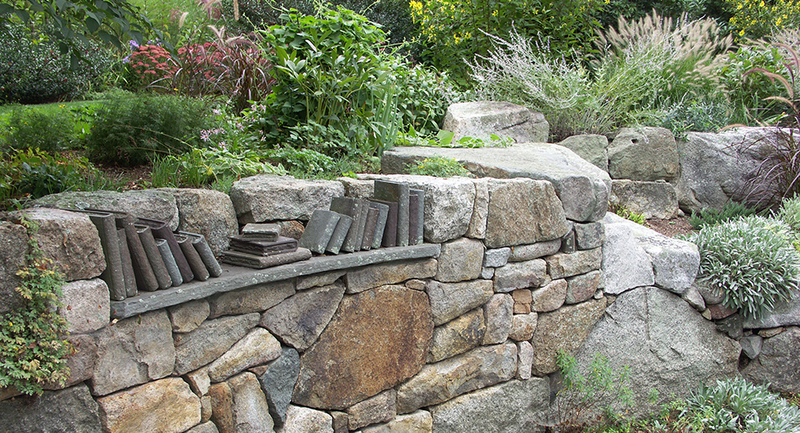 And here’s a whimsical garden wall by terra firma landscape architecture. * Wikipedia’s entry on “blooks” is all about books based on material first published in a blog. 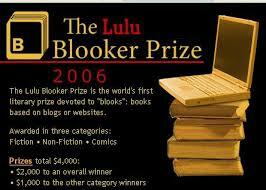 I’m not sure that usage has caught on either, though Lulu did run a “Blooker Prize” in 2006/7. I’m not sure it continues. The Oxford English Dictionary has yet to take note of either meaning of “blook”. Each month, Rooster will send two novels–a classic tale and a contemporary story–to a customer’s iPhone “in manageable installments, according to a schedule you set yourself,” the Post wrote. Debut titles are Herman Melville’s Billy Budd and a literary thriller, I Was Here, written specifically for the format by Rachel Kadish. Wired Magazine also had a piece on the service too, headed “Books become magazines”. I don’t think that’s really it: they become like a magazine only in that they are presented to you in shorter bits. A broken up book doesn’t make a magazine. All these suggestions that you boost your reading by biting off a regular, small chunk every day, don’t really appeal to me. What if you get to an exiting bit and you’ve just passed your 10% a day allocation limit, or worse, Rooster hasn’t sent the next part to you yet? Their website says “It’s an immersive reading experience that works with your schedule”. I’m not so sure they have that right — doesn’t it work with their schedule? Still at $5 a month, maybe it’s worth a whirl. Their monthly pairings do look quite interesting. This month’s books would be Elena Ferrante’s Troubling Love and Kate Chopin’s The Awakening. You can try it with a free two-week trial. DailyLit referred to in the Shelf Awareness piece is another easy reading site: they’ll send you 15 minutes of reading a day from a catalog of new and classic works. Sounds like that guy at High Existence should get in touch with one of these services. Open Culture delivers a transcription of T. S. Eliot’s letter to Orwell declining publication of Animal Farm at Faber and Faber. I did think of reproducing the letter here, via copy and paste, those two incorrigible infringers, but decided against, knowing the reputation of the Eliot estate for tenacious control over rights. Well of course no publisher has to publish any particular book. Eliot may be a little mechanical in his “two, one of whom must believe strongly” criterion, but like any publisher he’s trying to wriggle out of the problem that rejecting this book probably means rejecting all the author’s future books. The letter was released by Valerie Eliot, the poet’s widow, for a 2009 BBC Two Arena documentary. This transcript has been available at Open Culture since November 2013 and has been “shared” 2000 times. The YouTube film of Animal Farm linked to in their post has been taken down though.